It’s been going around the internet the last few years that the secret ingredient in Chick-fil-A’s delicious chicken is pickle juice. There is something about the chicken that is just amazing. It’s tender and juicy, just the way chicken should be. Of course, it’s not very healthy, and definitely uses up a lot of points for one meal. Because it’s not very healthy, I’ve made a copycat version of their chicken sandwich earlier. I like it even better than the restaurant’s sandwich. Mainly because while it has all the same flavors, it’s lighter and healthier – and cheaper – than going out to eat all the time. I decided it was time to try another Chick-fil-A copycat recipe. But this time I wanted to try it in chicken strip form. The first time I made this, it was the classic chicken fillet that I put in a sandwich. I used whole wheat flour for the base of my breading. It was perfect. Crunchy and delicious. This time, I wanted the exterior to be slightly crunchier, so I swapped out the whole wheat flour for whole wheat Panko. Let me tell you, they were absolute perfection! The bread crumbs made for a much crunchier and thicker crust than the traditional flour. It was perfect. The spices didn’t need to be changed at all, so I kept everything else the same with the recipe. The key to this chicken, making it juicy and tender and oh-so-delicious, is to marinate it for a couple of hours in dill pickle juice. You don’t need a ton of pickle juice, but you need enough to cover the chicken tenders. One way to make your chicken extra tender and juicy is to brine the chicken. This is because the salt in the brine solution helps the chicken retain it’s natural juices during the cooking process. While the dill pickle juice isn’t quite the same as a brine solution, it’s a similar concept. The higher salt content in the pickle juice causes the chicken to absorb some of the pickle juice and then retain that liquid during cooking. You need egg in order to help the breadcrumbs adhere to the chicken, but I lightened it up a little by using a whole egg and another egg white. That gave me enough egg mixture to coat all the chicken tenders, but also helped to keep the points a little lower. Another key to really delicious chicken tenders is to make sure that you season the breading mixture properly. Parsley, garlic powder, paprika, dried mustard, salt and pepper are all spices that you need to properly season the mixture. It’s important to season the breadcrumbs or the chicken tenders will just end up bland. Because these chicken tenders are baked instead of deep fried, they’re considerably healthier than the restaurant version. 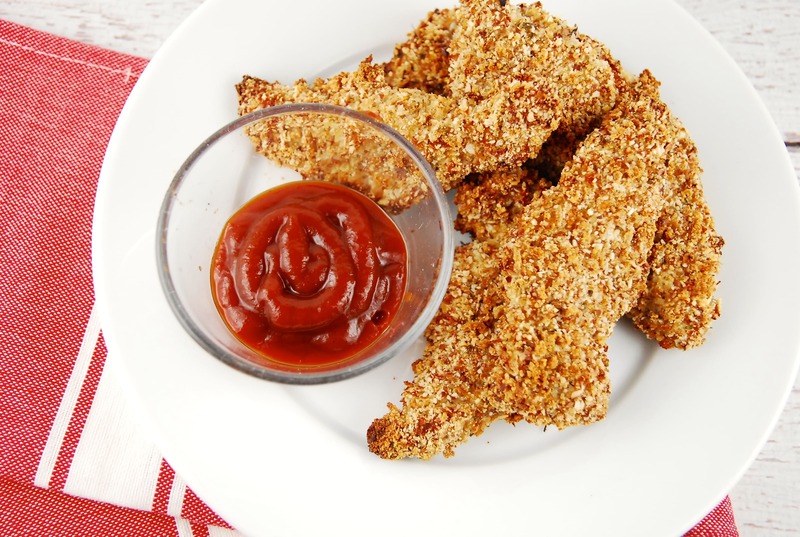 My kids love these tenders, and I felt great about giving them these baked, healthier chicken strips instead of the greasy, oily ones from the restaurant that you just know aren’t nutritionally filling. This is an ideal Weight Watchers lunch since it’s low in points for 3 chicken strips. So, instead of hitting up Chick-fil-A, try making this recipe at home and same yourself some Points (and guilt)! Need a fast food fix? Try these healthier versions! Get all the flavors of your favorite fast food chicken strips but with a lot less fat and calories. This baked version is lighter and healthier, but equally delicious. In a large bowl, place chicken tender and pickle juice. Cover and refrigerate for 8-12 hours. Preheat oven to 425, and line a baking sheet with parchment paper. Mist with cooking oil. Combine egg and egg white in a small, shallow bowl. In another shallow bowl, combine the Panko and the seasonings. Remove the chicken from the pickle juice, and pat dry with paper towels. One by one, dip each chicken strip in the egg, shake to remove excess, and then dip into the breadcrumb mixture, making sure to coat both sides of the chicken evenly. Place chicken strips on baking sheet, and mist with cooking oil. Place into the oven, and bake for about 10 minutes, then flip and bake for a remaining 5-7 minutes, until the crust is golden, and the chicken is cooked through. Serve with your favorite dipping sauce. do you use sweet or dill pickle juice?? Dill pickle juice :) Great question! I’ll update the recipe.